A few years ago, I had the opportunity to work on quite a few projects with the Kronk Gym Foundation. If you are not familiar with the name, they are a Boxing Gym out of Detroit that was started by Emanuel Steward, with proceeds from the non profit going towards keeping inner city youths off the streets and in the ring. 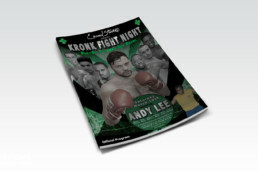 While I worked on a number of jobs for Kronk, I really enjoyed putting together all of the materials for this fight night that was a fundraiser. The main fight included Andy Lee, who was the WBO middeleweight champion from 2014-2015. 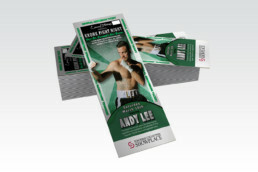 For this fight, I designed the tickets, program, autograph cards, and press credentials.